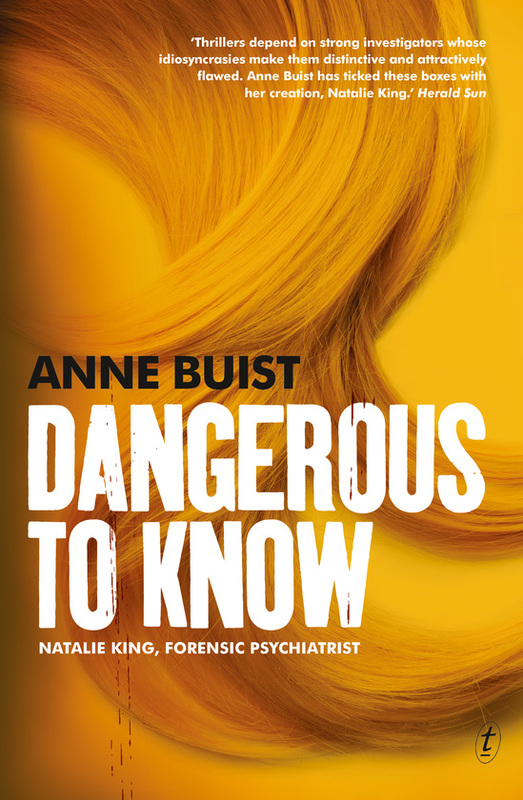 Anne Buist’s Natalie King novel Dangerous to Know could be described as a true psychological thriller. But only because the two main characters are psychiatrists. Most of the plot is taken up with the psycho-personal tousle between bipolar-recovering-depressive forensic psychiatrist King and potentially-homicidal-manipulator academic psychiatrist Frank Moreton. And while it takes a fair while for this joust to develop any heat it does build to a satisfying and twisty resolution. Natalie King, still recovering from the events of Medea’s Curse, has taken herself away from the pressures of Melbourne and her full time practice. Moving to a house in Lorne, on the Victorian coast, she seeks a research position at the local university working for Frank Moreton. Frank is married to a very pregnant Alison, an old adversary of King’s from their university days. And when Alison dies in much the same circumstances as Frank’s first wife Reeva, Natalie feels duty bound to investigate. As with Medea’s Curse, the character of Natalie King is the strongest element of this novel. Fiercely intelligent but struggling to deal with her psychological disorders, trying and failing to downplay the motorcycle riding, rockband singing wild girl as a way of managing her condition. Her growing relationship with a homicide detective and an old relationship with a married crown prosecutor do not make things any easier. But Natalie is constantly drawn back to that life and that person as the authentic expression of herself. While there is a sub-plot concerning the trial of a character from the earlier book, the focus is very much on Natalie’s investigation of Frank and his odd family. This tighter focus works well, but the book suffers slightly in the way of all accidental detective books in the way people respond to Natalie as if she was a detective rather than just a nosey bystander, and the fact that she is constantly taking risks to seek out information. Dangerous to Know is a significant improvement on Natalie’s (and Buist’s) first crime outing Medea’s Curse. The plotting draws heavily on Buist’s psychological expertise but, taken outside of Natalie’s consulting rooms, that knowledge is integrated more into the plot. The sparring between King and Moreton, particularly as told from Moreton’s point of view, is handled effectively. The creepiness factor emerges more organically from the story as does the danger to Natalie herself. Buist has delivered a well constructed mystery around Natalie King that manages to keep twisting through to the last couple of pages.